My family loves Chili-O chili. So I decided to make my life easier by making our favorite chili recipe in my crock pot this week. This Easy Crock Pot Chili recipe is easy to make and tastes delicious. This Crock Pot Chili recipe is a 4 ingredient crock pot recipe. I serve my chili over a bed of rice, but you can serve yours in a bowl with crackers if chili and rice aren’t you’re thing. I’ve been making this Chili-O chili for over 20 years. It is the only chili my family will eat. They love it. The ingredient list is short. All it has in it is ground beef, kidney beans, whole or diced tomatoes and the Chili-O seasoning packet. Since making chili, is mostly dumping ingredients into a big pot and constantly stirring. Throwing those same ingredients in the crock pot and letting them cook slowly makes perfect sense me. Now our favorite chili recipe is an Easy Crock Pot Chili recipe. My husband does not like tomatoes so I use canned whole tomatoes instead of diced tomatoes so he can easily pick them out of his serving. I would never make this chili without the tomatoes because they add so much to the flavor. It just wouldn’t taste like chili if there were no tomatoes. So if you have a picky eater in the family use whole tomatoes and pick them out before serving. If you like onions and peppers in your Crock Pot Chili you can saute them in the skillet before you brown the ground beef then add them to the crock pot while you are browning the meat. My family loves this Chili-O chili so much that I doubled the recipe. My husband loves to eat it the next day for lunch so I always make plenty so there will be leftovers. Place all the ingredients into a 6-quart crock pot and stir well. Cook on high for 3 hours or low for 4-6 hours, stirring occasionally. Serve over a bed of white rice if desired. 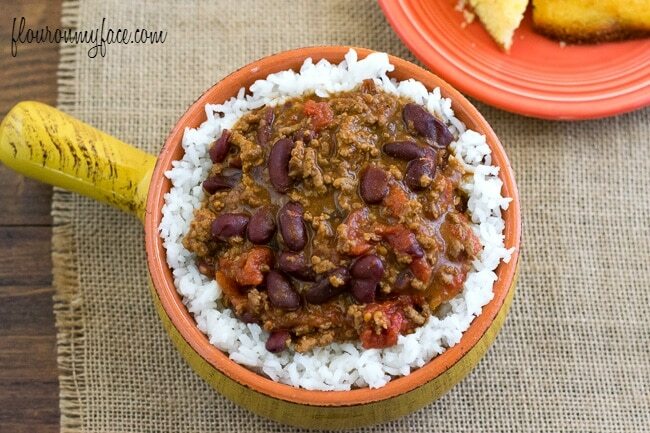 Easy Crock Pot Chili is so easy and delicious you and your family is going to love it. It is a busy mom’s dream recipe! 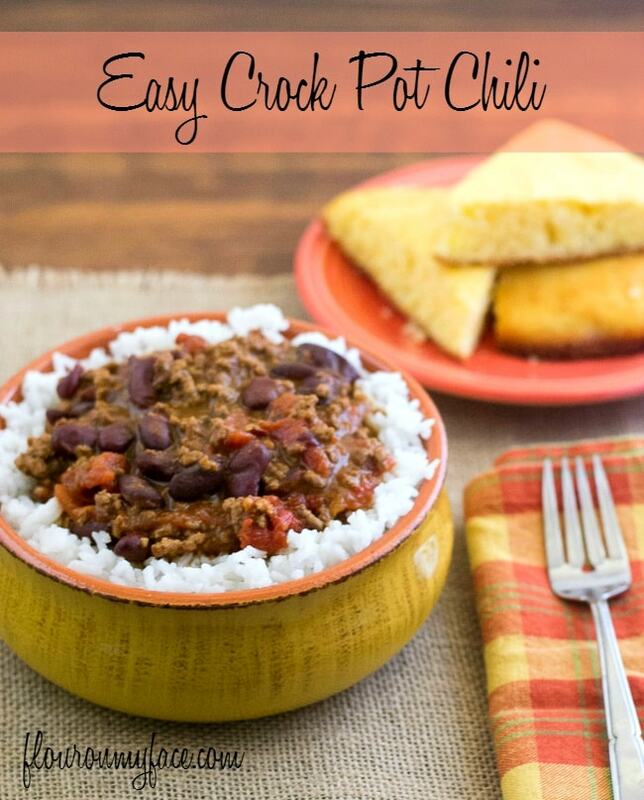 Did you just love this Easy Crock Pot Chili recipe? Check out the 100+ Crock Pot recipes over on my crock pot recipes page. Sounds like such an easy recipe!! We’re not fans of kidney beans in my family, so I think that i’d use pinto beans! This recipe is perfect becuase you can change it up to suit your family. Thanks for stopping by! This is absolutely positively perfect for football season!!! Love chili – and making it in the crockpot would be awesome to save time! Thanks for stopping by! You are right,this recipe is perfect for football season! Looks yummy. I’ve never heard of Chili O but, it sure makes it easy! I just made crock pot chili not that long ago.